The Bigger Blacker Box is an empty storage case big enough to hold all the Cards Against Humanity ever made, with room for even more. 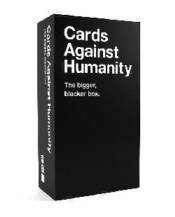 Does not include the Cards Against Humanity main game. We want to be very clear here, this is mostly a big empty box. One totally unique,procedurally-generated white card. ...There might be other surprises in there. Who knows?